Try our Beer testing kit! The “Beer Analysis Sample Kit” checks for alcohol by volume, International Bittering Units (IBUs) and Residual Sugar. Purchase a kit, fill the supplied bottles with your beer samples and post back to us in our postage-paid box. Purchase the test kit, fill the supplied bottles with your Beer sample and post back to us in our postage-paid box. 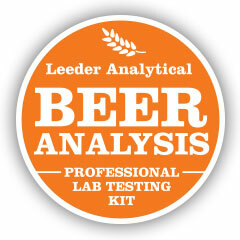 Click here to order a ‘Beer Analysis Kit’ today!